(Ace Records) 22 tracks with 16 page booklet. 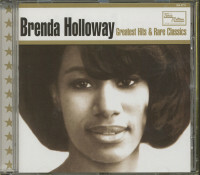 We’ve always known that Brenda Holloway was not your run-of-the-mill Motown diva. One of the imprint’s first signings from outside Detroit and its environs, Brenda grew up far from the frigid temperatures and blizzards that forged the harder-edged personalities and steely determination of Hitsville’s homegrown artists. This California girl exuded a sunny, laid-back persona light years from the fiery Ross or Reeves. Something else set Brenda apart. Her first Tamla release, ‘Every Little Bit Hurts’, and its subsequent LP spotlight a smooth, self-assured vocalist, oozing confidence and maturity that was clearly lacking in the early efforts of, say, the Supremes and the Marvelettes. Not quite 18, Brenda hit the spotlight with her artistry fully-developed, denying us the fun of hearing her fumble around in search of her style, an experience that makes the early waxings of Diana, Martha and Mary Wells so charming. 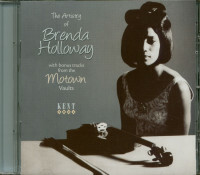 What we didn’t know then was that Brenda had already served a prolific, two-year apprenticeship in the studios of L.A. A few of these early sides have leaked out over the years but now, thanks to Mick Patrick and the archaeologists at Ace, “The Early Years: Rare Recordings 1962-1963” offers an opportunity to witness Brenda cutting her teeth in a variety of styles. Think of it as 'Meet Brenda Holloway'. Among the impossibly rare treasures: two doo-woppy demos believed to be the 15-year-old’s first crack at the mic, one (‘He’s Gone’) also the first recording evidence of the songwriting talent that eventually put ‘You’ve Made Me So Very Happy’ into the Great American Songbook. Brenda’s first release, ‘Hey Fool’, finds her rocking out with a radically tougher attitude than fans have heard before. Her obscure second single, ‘The Game Of Love’, a frothy girl-group confection, is here alongside more unheard demos, rare 45s and duets with three different male partners. On various songs, Brenda wails, belts, testifies and coos, trying on the styles of Tina Turner, Etta James, the Marvelettes, the Chantels and, of course, her idol Mary Wells. We also hear Brenda chiming in on background as a member of the Watesians, the Four J’s and the Carrolls (probably all the same group), and, most significantly, backing up her sister, the late, legendary Patrice, on ‘Do The Del Viking’, which the sisters wrote. The CD closes with the demo of ‘Every Little Bit Hurts’, presumably sung by Barbara Wilson to the same backing track as the eventual hit. When Brenda added her vocal to the song, she was more than ready for her shot at the big time. How great it is that we can now eavesdrop as she perfects that trademark emotional magic. Customer evaluation for "The Early Years - Rare Recordings 1962-63 (CD)"